So we're moving. Again. I know what you're thinking...three moves in a year, we must be crazy! First was the big move from Boston go Chicago. We moved into a gorgeous apartment that I loved! Then came the disgusting centipede invasion that had us moving out of our first Chicago apartment just 3 weeks after moving in. That's how we ended up at our current place, which I was just beginning to decorate. It's huge with all the space we need, but we have a lot of changes coming up this summer which means it's time to move...again! We're still on the hunt for the perfect place and hope to find it soon...we have to be out in a week! Craziness, I know! Our first Chicago apartment. Absolutely GORGEOUS! Darn those centipedes! Our current apartment. I'll miss the tall ceilings! 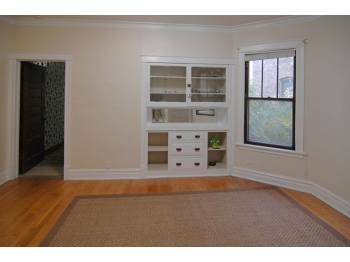 I'm so tired of apartment hunting, I thought I'd take a break to share this cute vintage apartment we found. It's not the right place for us, but it's just SO adorable, I hope a true vintage lover gets it! 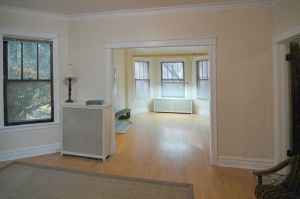 It's a 2bed 1bath in Irving Park with big rooms, a pantry, and enclosed back porch. It's the only apartment I've ever looked at where they kept so many of the details original to the house. Someone get it quick! Gorgeous foyer with the original door and wallpaper. Score! One whole wall in the foyer is made up of storage cabinets from floor to ceiling that open up to reveal various shelves and coat hooks. The cutest storage idea ever. Wish modern homes had these built-ins! Looking into the kitchen. Love the dark wood doors. 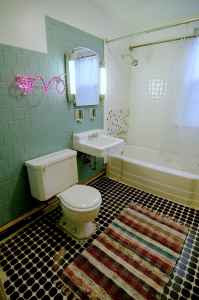 The wall tiles have been painted an aqua/turquoise color and the floor tiles are super cute! The ORIGINAL METAL CABINETS and counters!!!!!! Oh, and in-unit washer and dryer. Interested? Check out the full details here. Your current apartment looks so great! I'm sad you have to leave, but hopefully something exciting is ahead? between the built-ins and the wallpaper i love it. good luck with your search. i'm sure it will be nice to finally settle in one place. i once moved three times in a year and when i finally completely unpacked i re-discovered so many objects that i hadn't seen in months and months. Wow, good luck. Moving is so hard! The first Chicago apt. was to die for!! The second, ultra fabulous. Thanks guys! We successfully found a place and got moved in. The new place is great...the perfect mix of vintage and modern so I'm happy! Jen - I agree with you about making a hasty decision. We've done that before and it wasn't good! Thankfully we prayed super hard about this place and I'm happy with the choice. Elissa - I've been rediscovering old things too. We've moved so much that we still have boxes we haven't unpacked since we first moved to Chicago in August! It's kind of fun, like shopping for free!! it looks really nice, and I love the pink curtains, why should you leave? I guess your heading for something better.. It looks great! Apartment living is the recipe for happiness. I really like living in a vintage style apartment.